Wheel alignment and wheel balancing for your car: How, when and why? Wheel balancing and alignment: Rs. 1000 says your service bill. What does that mean? Over the past couple of months we’ve received a number of queries on when and why to perform wheel balancing and alignment. Here’s a ready reckoner as to when and why you need to perform wheel balancing and alignment on your car. It’s a relatively simple service task, but having unbalanced tyres or misaligned wheels can lead to a number of problems including wobbling, vibrations and uneven tyre wear, car pulling to one side, or in extreme cases even wheel bearing and suspension failure. Also read: Suspension problems: What to fix and how? Wheels are round, but their weight distribution need not necessarily be uniform all around, and this is more so after a puncture has been fixed or the car has gone over a few bad potholes, causing minor imperfections in the wheel which can shift the weight distribution from dead centre, leading to an unbalanced wheel. A wheel that is not properly balanced will tend to either wobble from side to side or up and down, and while driving this manifests itself as a vibration in the steering and the whole car will tend to wobble at certain speeds. How often should you balance your wheels? The ideal duration is every 5000 km or so, but you would also need to balance a wheel if you have a puncture and the tyre is removed for the puncture to be fixed. Slamming on the brakes or suspension problems can lead to flat spots on the tyre which would also lead to an unbalanced wheel. Any vibration or wobbling would mean wheel balancing needs to be checked. 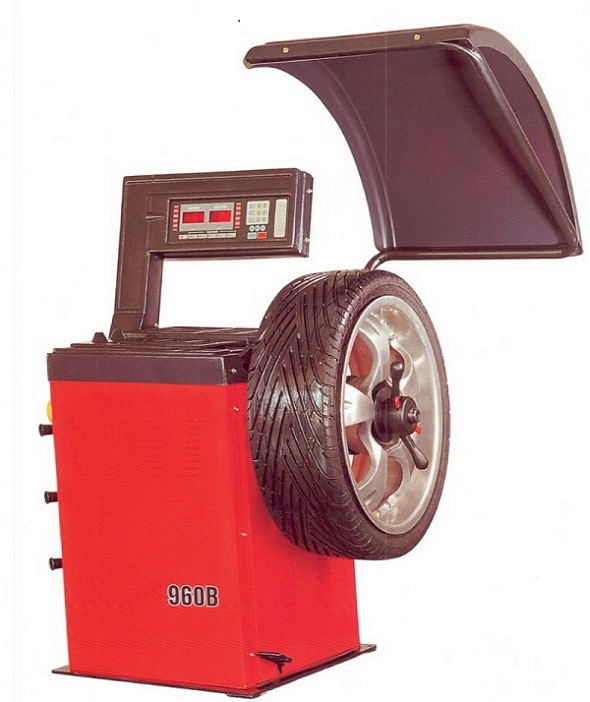 Service centres or tyre shops charge for wheel balancing by the number of weights used on the wheel. Charge range from Rs. 200 to Rs. 500 on average for balancing a set of four tyres. Wheel alignment in the car is a slightly more complex adjustment. It involves measuring whether the wheels are aligned with respect to each other (are they parallel or not) and with respect to the body of the car. Wheel alignment can go out of synch if you drive on bad roads and hit a few bad potholes (even minor bends in the suspension can throw out wheel alignment). There are three adjustments to be made for wheel alignment: Toe-in or toe out, camber angle and caster angle. Of these, the most common adjustment is the toe-in/toe-out adjustment which is what a normal alignment check would entail. Toe-in or two-out is the angle at which the front of the wheels is pointing slightly more inwards (toe-in) or wider (toe-out). Most cars usually have a slight degree of toe-in to help automatic re-centering of the steering on turns and to compensate for camber angle. Toe-in or toe out can easily be adjusted using the adjustment nuts on the tie-rods (linkage from steering shaft to front wheels). Camber angle is the angle at which the top of the wheel and bottom of wheel are with respect to each other. If the top of the wheels are closer to each other and the bottom is wider (wheels slanting inwards), it is negative camber. If the top is wider and the bottom of the wheel is closer (wheels slanting inwards) it is positive camber. Camber does not need to be regularly adjusted unless there’s a suspension problem – it is done by adding or removing shims to the suspension upper arm mounting point. Caster angle is the angle at which the suspension is aligned to the axis of the wheel. If the suspension mounting point is behind the axis it is positive caster and if it’s in front of the wheel axis, it is negative caster. 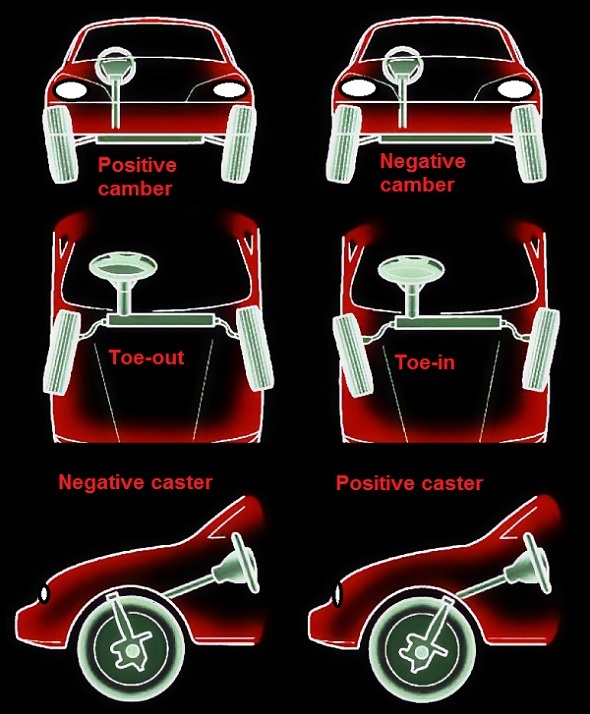 Most cars have positive caster. It usually does not need to be adjusted, except in rare cases of an accident or suspension damage. To keep your tyre wear uniform, along with wheel alignment and balancing, also get your wheels rotated. This means the pair of wheels that were in the front will now go to the rear and rear to the front. There are different kinds of rotation patterns.